Rec Boat Holdings presented their model year 2015 products to a worldwide audience of retailers August 12th at their annual dealer meeting. The company held the meeting at their home base of operations in Cadillac, Michigan. The dealer networks for all four of the company’s brands converged on the two-day session. The company displayed new 2015 boats in the water and on the ground so dealers could water test and explore the new models as well as changes to the existing models from each brand. “This is an evolutionary year for our brands,” Lambert continued. “Our Four Winns and Glastron lines were due for refinements since we launched all new designs four years ago and dealers are pleased with the enhancements done to the boats. We’ve grown our Scarab jet boat line to include the new 165 power rocket and the twin Rotax-powered 215 models,” he added. 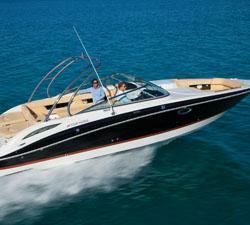 “And, our focus has now shifted to our Wellcraft brand with plans to expand and update the line in 2015,” he concluded. The company communicated their plan to continue investing in new product development and providing dealer partners a larger, stable foundation under the new ownership. www.fourwinns.com , www.glastron.com, www.scarabboats.com , www.wellcraft.com.